Is your jacket not quite standing up to the harsh winter cold anymore? Or maybe, like me, you've actually lost the winter liner that it came with? Afraid you might have to give up a favorite for something a little warmer? Fear not! Now you can make your own warm (removable!) winter jacket liner! Flip your jacket inside out. You're going to need a pattern for one of the front panels (picture 1) and for the back panel (picture 2). This simplest way to do this is to get a piece of newspaper big enough to completely cover the area (I had to tape some pieces together) and pin it down to keep it in place. Now it's up to you. You can guesstimate the lines and cut away, you can feel for the seams and draw yourself a line to cut, or you can fold the newspaper to make a crease (picture 4) and cut along that. Any way you choose, it doesn't have to be perfect. Also, try to err on the larger side...you can always cut something smaller! Label your front piece on both sides. I cleverly choose the names "Side A" and "Side B". Now you're going to make the lining panels. Take the fabric you chose for your liner and flip it so the wrong side (the side you don't want showing) is facing up. 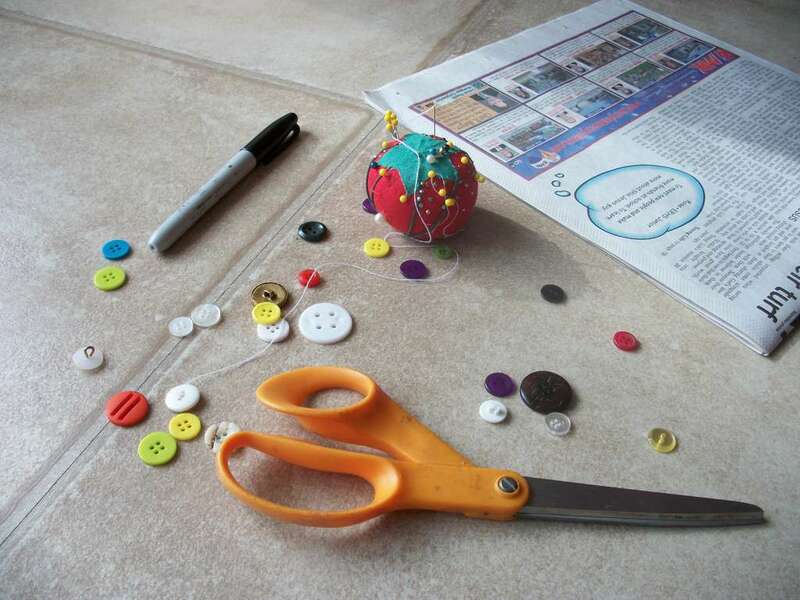 Place your fresh cut newspaper patterns on top and pin them down. Use your marker or chalk to trace around your patterns. Remember!! You need two front panels. Trace it once with "Side A" facing up, and then a second time with "Side B" facing up. 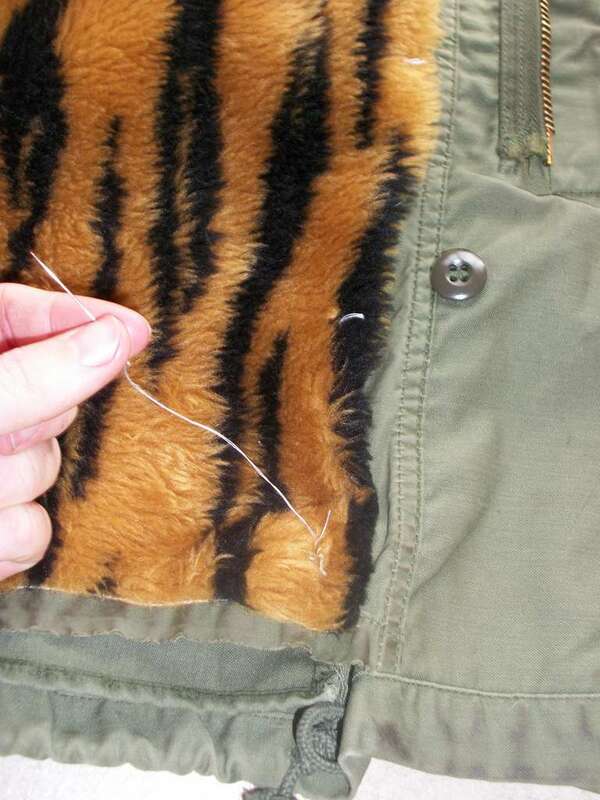 Now is the time to lay them on your jacket where they belong and trim any access fabric or bulges you may have accumulated. Your pieces should be within, but close to, the seams around their corresponding panels. Too small will still work, but if it bothers you, you can make a new piece. 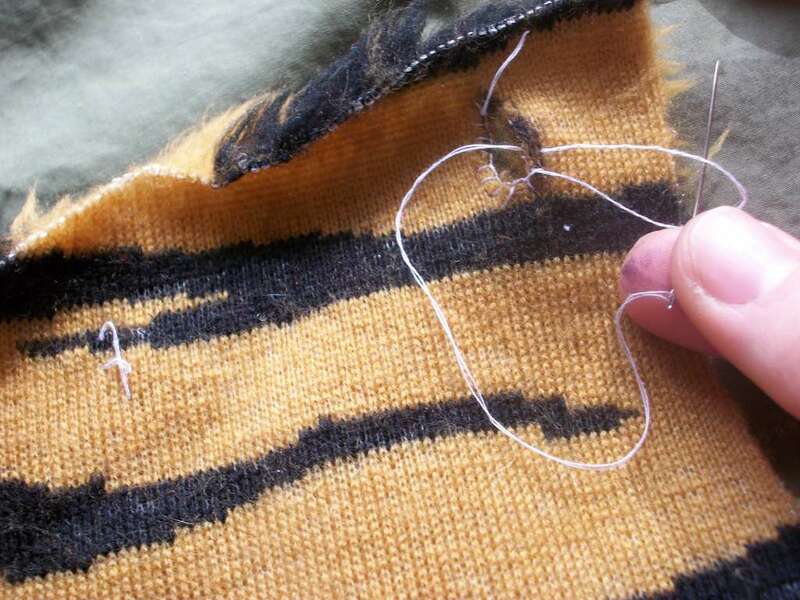 Note: If you're using a thinner fabric, you could cut out two pieces for every panel and stitch them together! If you want your liner to be removable, this is the next step. If you would prefer your liner to be affixed, skip ahead to step 6. Let's start with the back. Lay your fabric on the inside back panel of your jacket (where it will be when we're all finished). 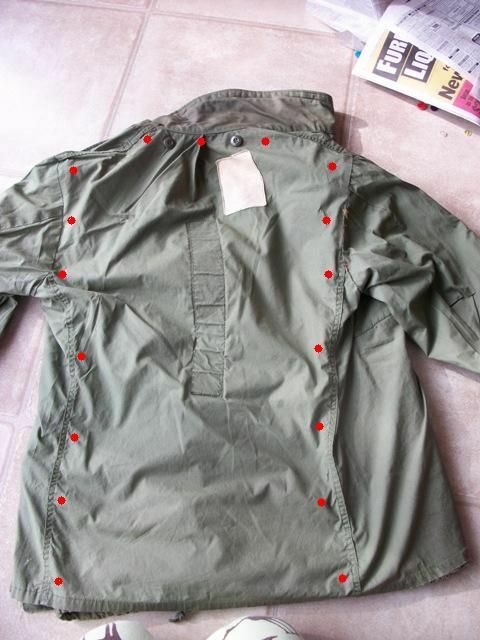 Using your marker or chalk, lift the corner of the fabric and make a little mark on both the jacket and the fabric where the button and it's corresponding hole will be. Mark all four corners. You'll also want one to two buttons between the corners. Picture X shows where I made my marks. Do the same thing for your front panels. One button in each corner, with one or two between them. See picture X. 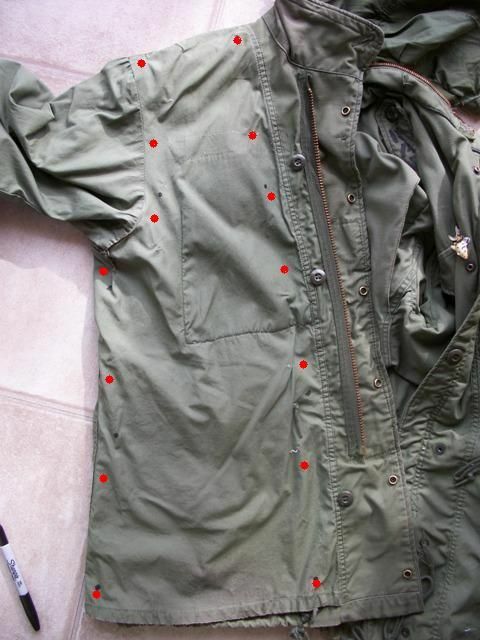 Using your needle and thread, attach buttons to your jacket where you made your marks. 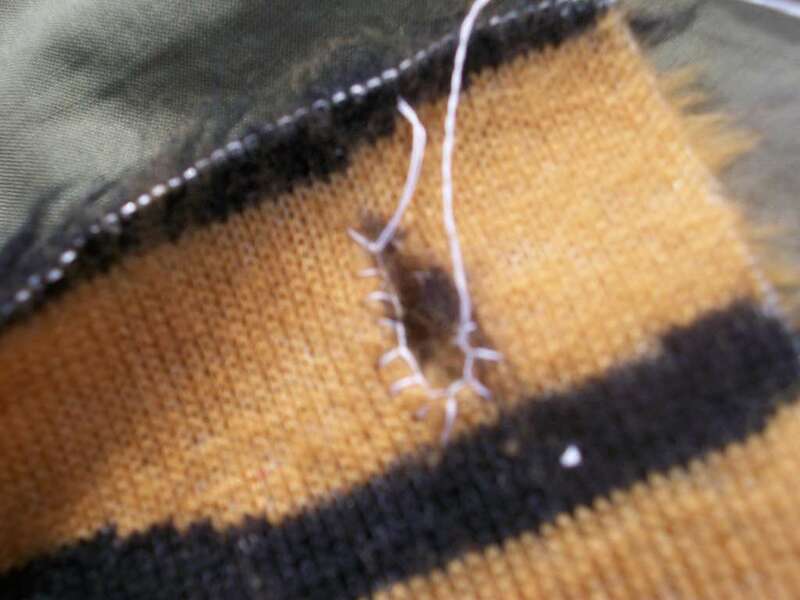 Be careful to only attach them to the inside layer, not through to the outside of your jacket. Give it 6 or 7 stitches, to be sure. 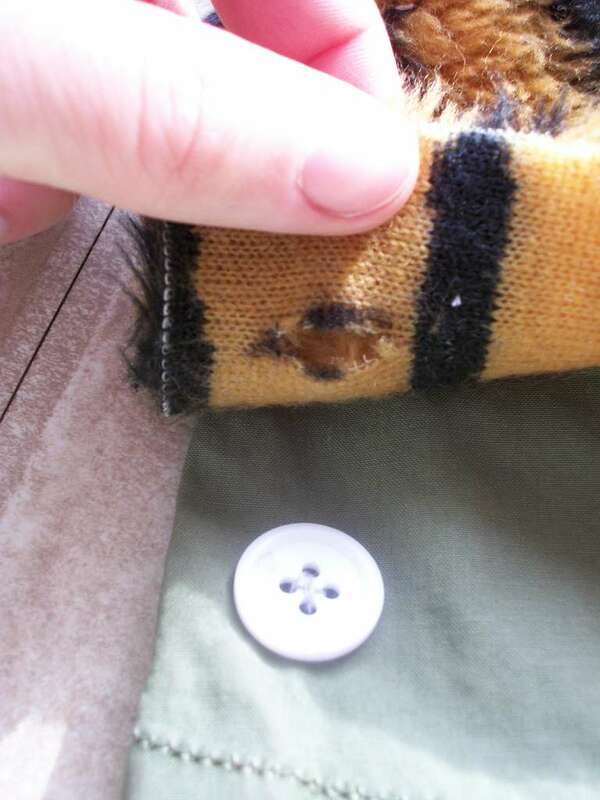 Cut your button hole to be the same width, or even a tiny bit smaller, than it's button (picture 1). There's probably a name for this stitch, but that's beyond me so I'm just going to describe it to you. Attach your thread. 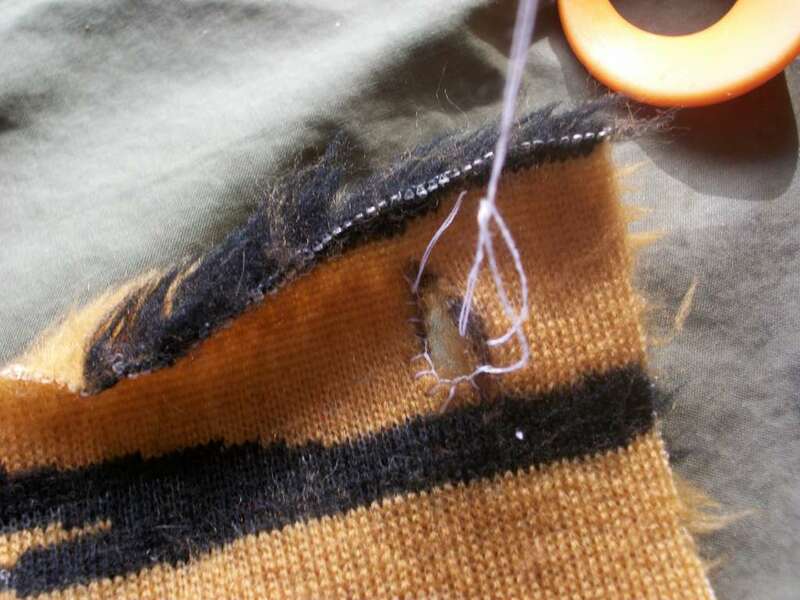 Working on the "wrong" side of your fabric, run your needle through just less than a quarter inch from the hole (picture 2). Pull it through, but not all the way (picture 3). Run your needle through the loop that you just made (picture 4). Pull the thread (picture 5). 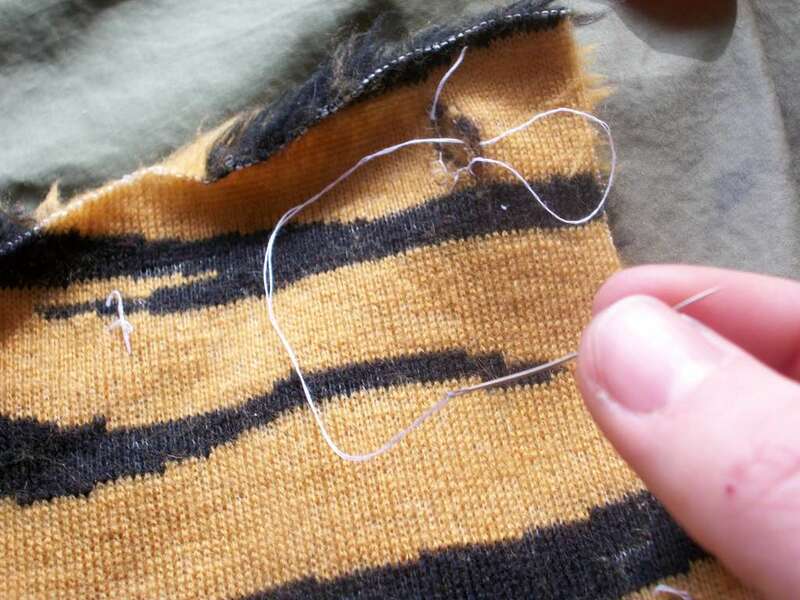 This should close that loop around your thread, lining the button hole (picture 6). You can make your stitches closer together if you want, but this distance is fine...these buttons don't get a whole lot of wear. This is what I prefer to do. Instead of attaching buttons and making the liner removable, I just stitch it right onto my jacket. It just takes a few quick stitches in a few recommended spots (pictures 1 and 2), and you're set!! Feel free to add more or even a running stitch along the whole thing. 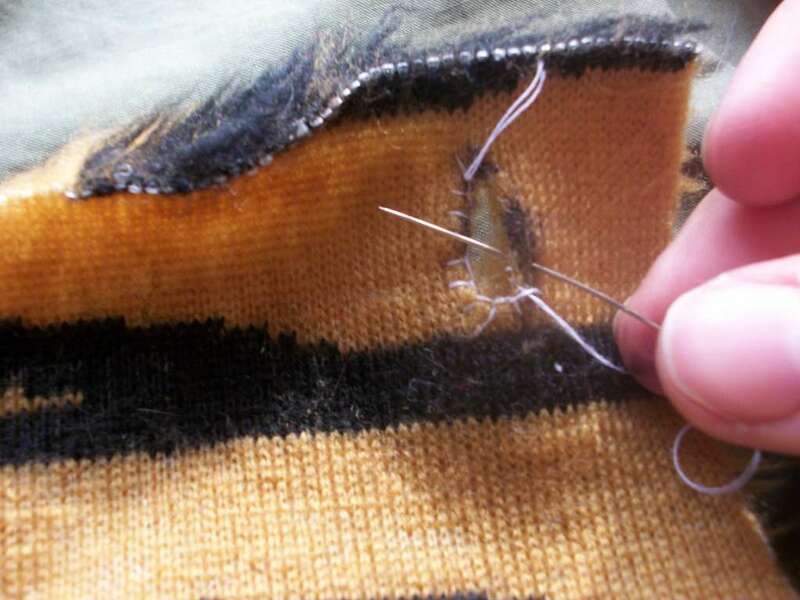 Just be careful...you only want your stitches to attach to the inside layer of your jacket. It will look ridiculous of you run the thread all the way to the outside! You're done! Now you can face that winter chill with the confidence and assurance that your jacket will keep you those oh-so-critical few degrees warmer. can't wait to try this! Thanks so much! 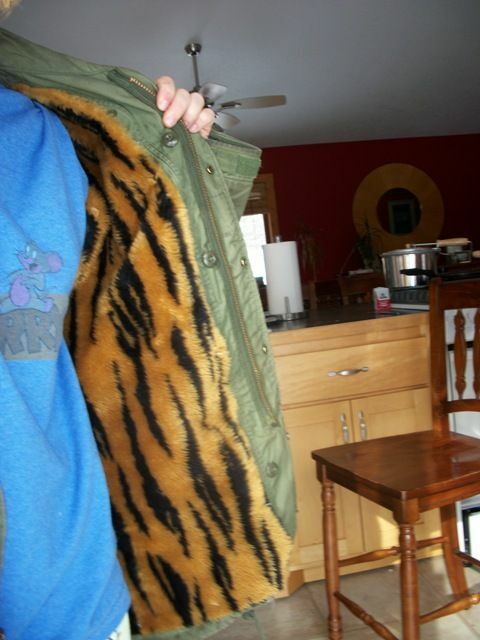 I have a coat I love but this winter has been so cold and I just didn't want to fork out almost $100 for a down coat. Voila and here you are! Simultaneously overkill and not enough on the buttons, not that you needed to add any at all -- those big green buttons around the edge (3 each side, and two on the shoulders) are for the stock cold-weather liner, pictured below. They are, by the way, sewn all the way through the outside layer; apparently the US Government didn't trust the lining fabric alone to hold the liner. But you shouldn't have any problems, spreading the load out over that many buttons. 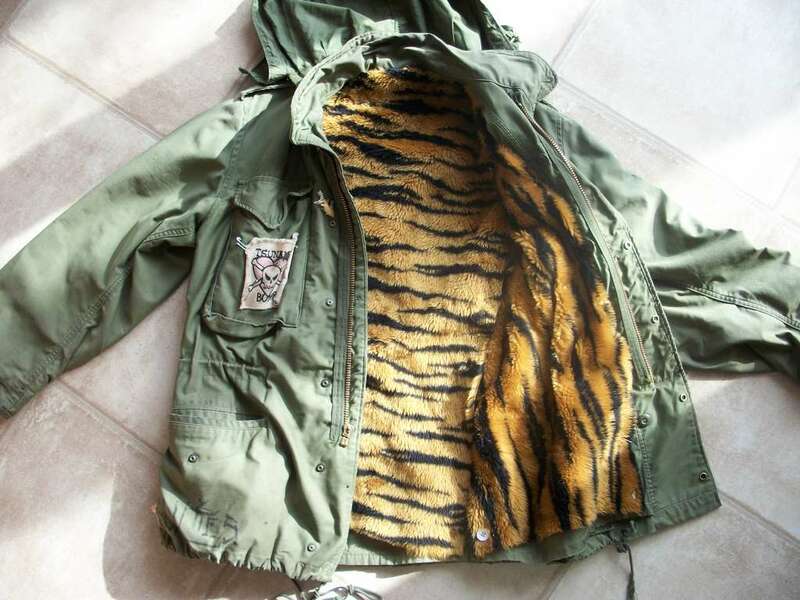 I do like the tiger stripe fake fur, though, as well as the other commentator's fleece sweater idea. Perhaps make multiple liners of varying thickness/insulation quality so you can have the perfect coat for any weather! 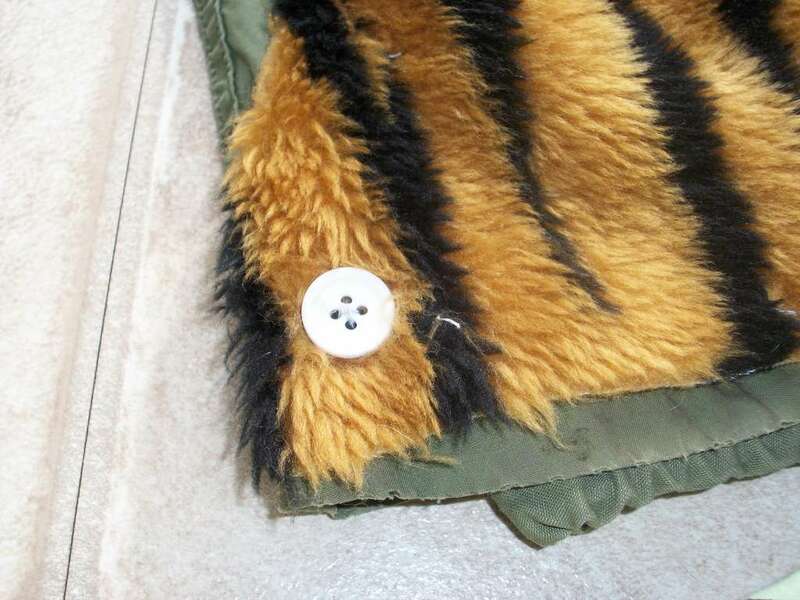 In case you were wondering, the random button, snap, and buttonholes on the outside around the collar/lapel area are for attaching the fur-lined arctic parka hood. Why they used three different fasteners, I have no idea. But I'm wondering if we could replace the buttons with some little snaps? Also, instead of cutting out the front panel twice, you could fold that part of the fabric, with the nice side on the inside of the fold. You'd have a mirror image and both parts cut out at once. The only problem I can see rising from this would be if the fabric resists cutting at that thickness. Very nice! 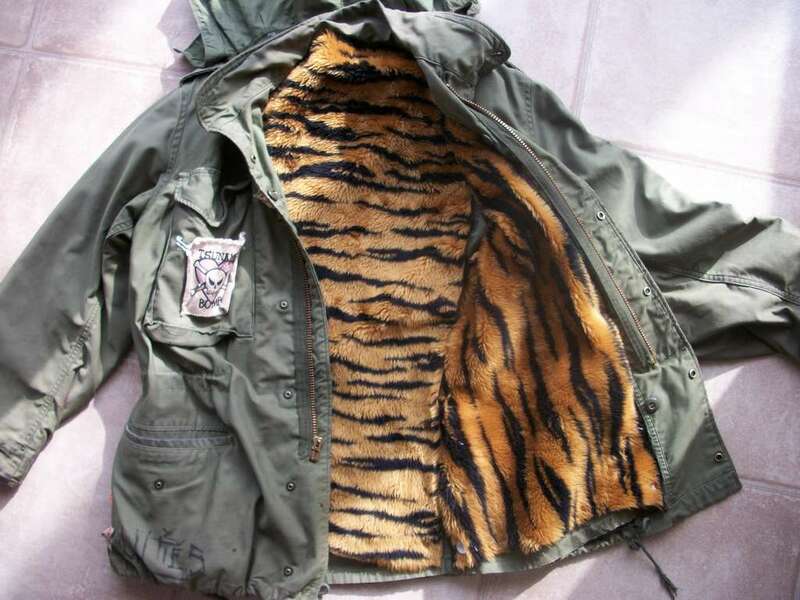 That M-65 looks pretty cool with tiger stripes. like this, then your liner would have sleeves. That would work great! I tried it out using this stuff to line the sleeves, but it was really bulky and uncomfortable. I find this to be plenty warm with a sweatshirt or long sleeved shirt underneath it, though.